After growing up in the dry, desert scrubland of San Diego, CA, Andrew desired a change of environment and a more relaxed lifestyle than the typical Californian rush. Lucky for us that change led Andrew here to Smokingpipes.com where he serves as our Shipping & Receiving Specialist. 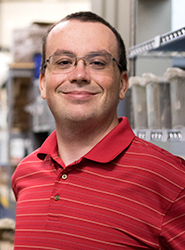 Constantly busy, he's responsible for receiving all of our inventory, managing our incoming and outgoing freight shipments, keeping track of inventory, and making sure we all have the supplies we need. When he's not at work you'll likely find him at the beach enjoying the warmer water of the Atlantic or indulging his interests in cheesy comedy films, spy thriller novels, world cultures, and WWII military aircraft.